When you were born, were you asked if you wanted to be a boy or girl? Did you decide on what culture you were brought up in or if you wanted to belong to a rich or a poor family? Would you have chosen to be born with a disability, and if so what type? Many choices about our lives were made for us, some biological and some socially constructed. Whether we are born into a social class, or forced into one, it is fair to say that much of our country’s inequality relates to class. Here are some types of inequities that many Canadians face daily. As this chart of unemployment rates shows, there isn’t much difference between unemployment by gender, however the greater the disability, the more likely you are to be unemployed. Disabilities can cause poverty and poverty can cause disabilities. Will the cycle ever end? 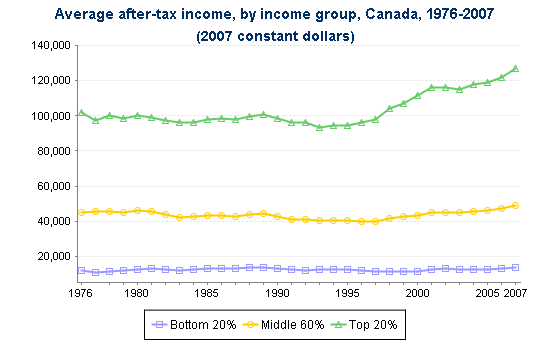 As this graph shows, 60% of all Canadians fall into the category of “middle income”. With subsidy programs for the poor, and the financial ability of the wealthy, it is the middle income earners in Canada who struggle to find fair legal representation in the Canadian court system. Across the country, students with reported cognitive/emotional disabilities score well below the national average of 530 and a lot lower than the students with only physical impairments. Newfoundland students had the lowest score at just around 390. This situation will continue if school districts either do not provide necessary accommodations or do not challenge these students hard enough to reach their potential. Jobs in secondary manufacturing jobs, 2000-2009. According to this chart, a feature of the 2008-2009 recession was the impact on the industrial sector which affected particularly the manufacturing, construction, resource, transportation and warehousing industries. Secondary manufacturing accounted for over half of all job losses. – Sébastien, LaRochelle-Côté and Jason Gilmore. 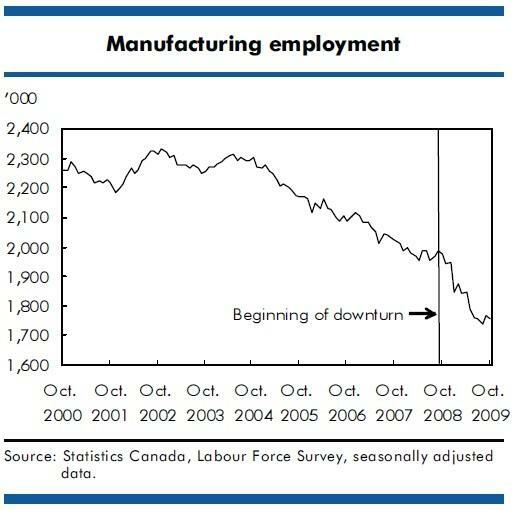 “Canada’s Employment Downturn”. Statistics Canada. 20/11/11.